Momma Told Me: Clean up all these cords. I remember, a few years back, induction charging was all the rage. People were investing absurd amounts of money in specialty cases for their electronics, which cut down the expression of such devices, in exchange for a drag and drop charging system. The concept was revolutionary, at first, until the production of such charging 'cases' couldn't keep up with the demand of newly released devices, and the technology soon fizzled out. It seemed, even in our wireless age, we were destined to be slaves to the unstoppable force of tangled cords and overcrowded outlets. And, as someone who despised untangling her Walkman headphones in high school, I am no friend of cables and cords. There is something about seeing a pile of wires protruding across your workspace and over the edge of one's desk that simply stresses me out. Thankfully there are several creative charging solutions in the form of multi-charging workstations. 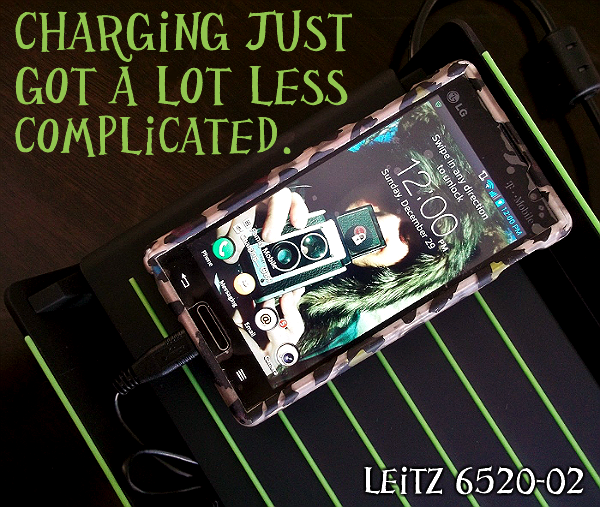 At less than 3lbs, the LEITZ 6520-02 Multi-Device Charging Station for USB powered devices is an affordable solution for electronic devices ranging from cell phones to tablets, and even some gaming systems. Ready to use out of the box, this station includes Mini USB, Micro USB, Standard USB, and a 30 Pin Apple Charger adapter head, and is also compatible with your own existing cables. However, I find it particularly useful that this charging station includes it's own hook-ups, so you don't have to give up your mobile charging cables for on-the-go and travel charging. The LEITZ 6520 has a slender workstation profile that accommodates up to 3 smaller mobile devices (iPods, smartphones, handheld gaming units) lengthwise, though larger Phablet style phones will have to rest horizontally when a tablet is charged into the top mount. 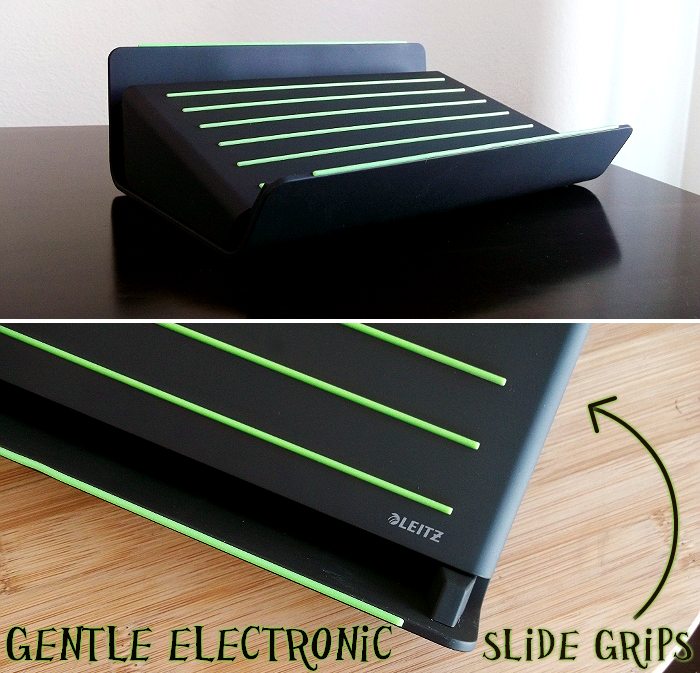 On the face of the unit are 6 lime green 'grip' ledges that help keep your electronics in place and prevent sliding, though the color may be a little bold for some home office decor. A lip at the base of the unit acts as a shelf for smaller mobile devices, so you can always see the screen of your devices while charging, to keep an eye on mobile alerts. A groove at the top of the station allows tablets to sit upright, in a small ledge for viewing and interaction while charging. 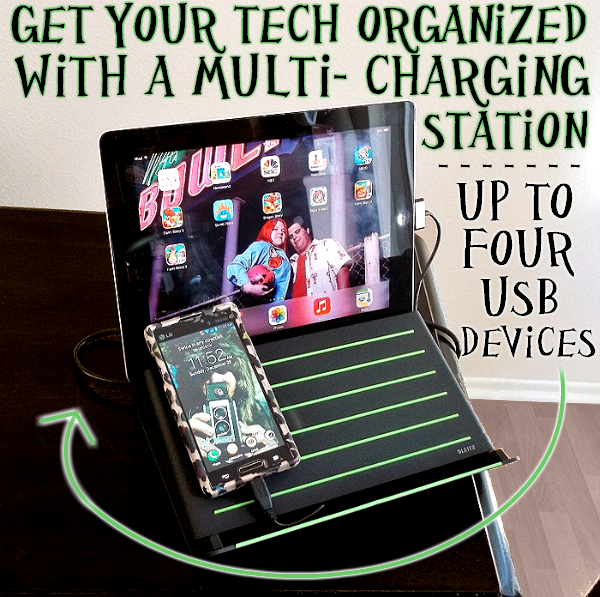 This also makes the Multi-Device Charging Station great for staging in the kitchen where it can also double as a stand for digital recipes and such. The top of the station lifts up to reveal the 'cord hideaway' and 4 USB inputs. 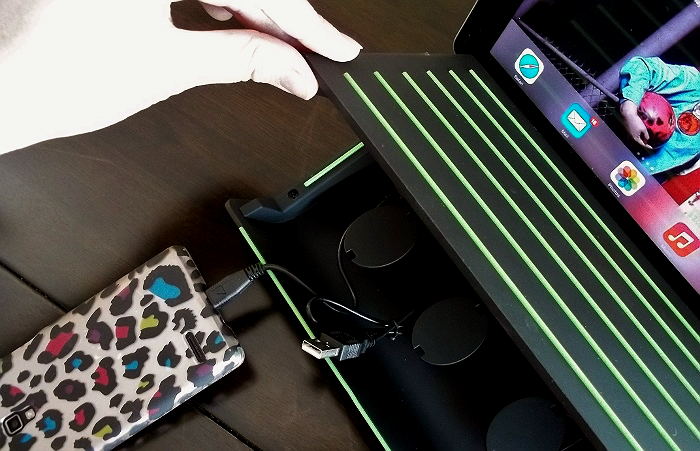 The charging port on the far right is intended for tablet charging devices, and the cord easily feeds up through a gap in the back of the folding top. 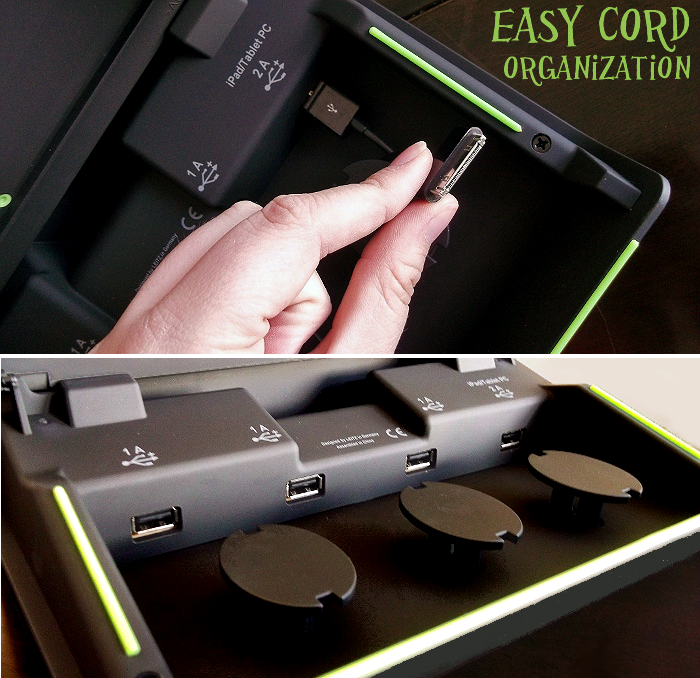 The remaining charging outlets are intended to be wound around the provided cord keepers to help cut down on clutter and easily identify which cable goes to what device. I found my own cords a little short for several rounds, and sometimes stiff. In the end, with 4 devices plugged in, it is a bit cluttered, but happily out of sight when the station's lid is closed. Because this station can charge up to 4 devices simultaneously, using a trickle charge, the charging is somewhat slower than a direct AC Adapter output. However, stations such as these are intended to organize devices for overnight or long term charging. In other words, docking your devices here at the end of each day will offer a stable station to house all of your electronics, and provide a full charge by morning. However, if you need a quick charge before heading out of the house, I suggest reaching for the direct AC adapter for the quickest boost. 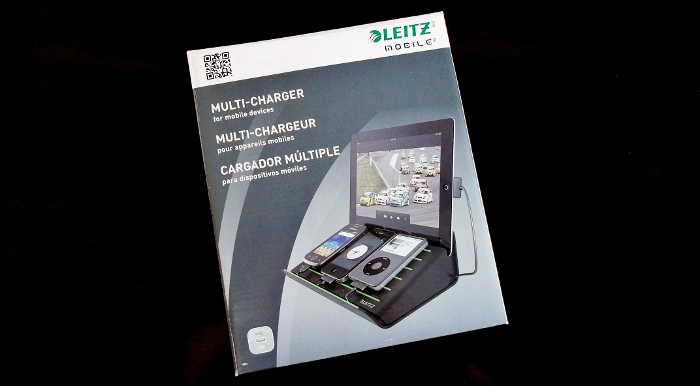 The LEITZ Multi-Device Charging Station is particularly nice for mothers who have children that like to watch tablets for programming and engaging games, but find the battery supply dwindles quickly. The sturdy docking station makes a great viewing platform, and also doubles as a 'no touch' zone for little hands. In all, this would make a great gift for any techie junkie- or the wife of any techie junkie, who is tired of seeing cords all over the place! What Daughter Says: Keep cords contained with a multi-charging station solution. 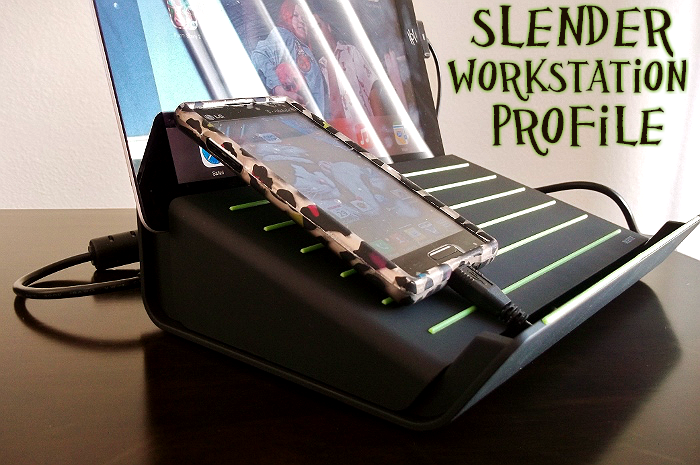 One Momma Told Me reader will win a LEITZ 6520-02 Multi-Device Charging Station from Penny Wise Office Products and LEITZ! the hubby just got a smartphone so that for sure. Beyond that we are really not device folk. Could I charge myself? I need some get up and go? What a great way to get organized!!! I so need this! Thank you! I might charge an iPhone, smartphone, tablet, and video camera with it. I am a super organized person so this would be awesome! I can never find my phone! This is awesome! My fiance and I are always looking for our chargers around this house. This would be so much easier! Tablets, laptops, cells! You name it! I would charge my laptop,droid,and son's mp3 player on it. I would charge my iPhone, iPad and my ereader. I would charge my smartphone and I pad. I would be able to charge my cell phone, my daughters cell phone and my boyfriends cell phone all at once! I would use it to charge my and my husbands Iphones and my sons ipod. I would use it to charge our phones and tablets. I would use it to charge mine and my husbands cell phones and my e-reader and iPod. I'd charge my iPod touch, my digital camera, and my Kindle. We would charge our ipad and phones. This is just one of the handy features that you will find with this cell phone charger. A universal USB port ensures that android devices, iOS devices, Kindles and others can all be charged with this one charger usb charger multi ports charger for the smartphone.